For the first time in more than a decade, the Drum Corps International Tour will start and end in the same city, as all roads lead to and from Indianapolis during the summer of 2014. 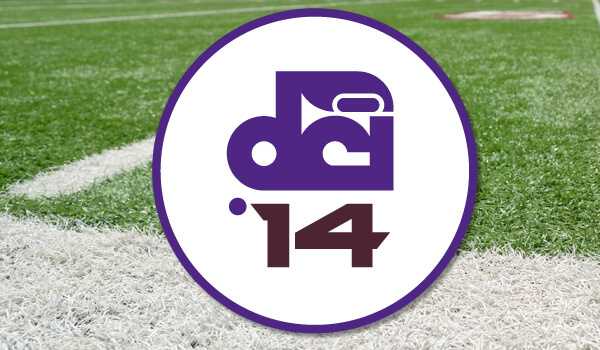 By the numbers, the 2014 DCI Tour will feature 105 competitive events produced over 53 days beginning June 18. More than 45 drum corps representing Drum Corps International's World, Open and All-Age divisions will tour 37 states as they perform their way to Indianapolis for the season-ending DCI World Championships in August. "We've worked with the participating corps to assemble a schedule that's very consistent with previous years in order to provide them with the greatest possible degree of stability for planning their travel," DCI Executive Director Dan Acheson said. "This also affords fans the opportunity to enjoy their favorite events in familiar venues on similar dates to those which they've grown accustomed." Corps will be taped at the Univ. of Akron on June 21 for a nationwide movie theater broadcast aired two days later. 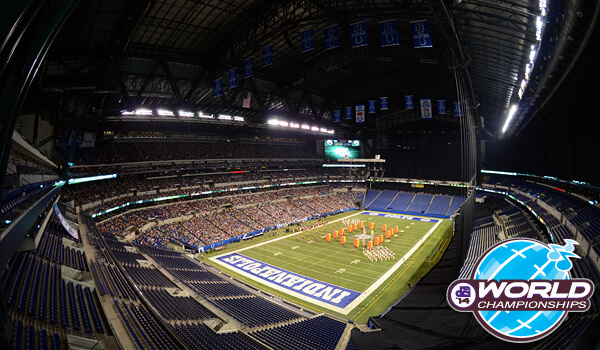 The 2014 DCI Tour will kick off with a brand-new event in Indianapolis on Wednesday, June 18, taking place at Ben Davis High School, just 10 miles from where corps will finish their summer season at Lucas Oil Stadium. The season-opening show will feature the defending World Champion Carolina Crown against a lineup of corps that includes the Cadets, Cavaliers, Phantom Regiment and Troopers. For those drum corps fans who can't make it out to the Midwest to experience the first events of the 2014 Drum Corps International Tour live and in-person, an evening of early-season performances will once again be brought to movie theaters nationwide on Monday, June 23. Featuring the Bluecoats, Boston Crusaders, Carolina Crown, Cadets, Cavaliers, Madison Scouts and Phantom Regiment, the "2014 DCI Tour Premiere" will be taped on Saturday, June 21 in Akron, Ohio and broadcast in cinemas across the country just two days later. "As the popularity of our movie theater events continues to grow with both the 'DCI Tour Premiere' in June and our 'Big, Loud & Live' broadcast of the World Championships in August, we're excited to continue to provide fans across the country with this opportunity to gather together and immerse themselves in the drum corps experience," Acheson said. Simultaneous to the season-opening events in the Midwest, the western portion of the DCI Tour will also be underway. Events in California will kick off Friday, June 20 in Clovis, with the "Best of the West" heading to Stanford Stadium on Saturday, July 21. Making a special trip to the West Coast this year will be San Antonio's Crossmen who last toured California when the DCI World Championships came to the Rose Bowl in 2007. In 2014, the corps will also extend its tour up to the Pacific Northwest, competing as part of DCI Tour events in Oregon and Washington the first week of July. All 22 of DCI's World Class corps will compete at the Atlanta Georgia Dome on Saturday, July 26. Drum Corps International's Premier Events are a collection of some of the most prestigious stops on the DCI Tour. Generally produced in larger, collegiate and professional sports stadium facilities on key weekends throughout the summer months, these events draw some of the biggest lineups and crowds of the season. West Coast corps will begin making their way east by the first week of July coming together with corps from the East and Midwest on July 12. On that day will be the DCI Minnesota Premier Event in Minneapolis in addition to the longstanding Drums Along the Rockies in Denver. In Minneapolis, the University of Minnesota's TCF Bank Stadium will be the site of the very first meeting of last summer's gold and silver medalists Carolina Crown and the Blue Devils, while Denver will host the hometown Blue Knights and Santa Clara Vanguard, along with the Madison Scouts who will make a return to Mile High City for the first time since 2009. On Sunday, July 13, the 2014 Tour of Champions (TOC) event series will kick off in DeKalb, Ill. Debuted in 2011, the TOC brings an exciting, nontraditional and experimental event format to the DCI Tour. Featuring the top 7 corps from last year's World Championship, this year's TOC will also feature a rotating lineup of guest corps as part of the eight-event series. The following week corps will head deep into the heart of Texas. A return to the indoor San Antonio Alamodome on Saturday, July 19 will be the first time during the summer of 2014 that drum corps fans get to see a lineup of all 22 of DCI's World Class corps compete head-to-head on the same day of competition. Coming out of Texas most corps will travel through the southern United States with a contingent of groups returning for a second year of competition at Alabama A&M in Huntsville on Friday, July 25. The other half of those corps will head to Middle Tennessee State University in Murfreesboro on the same day. Those events will precede one of the biggest events of the season, the DCI Southeastern Championship at the Atlanta Georgia Dome, which after a scheduling conflict caused the event to be held on a Sunday in 2013, will return to its normal spot on the calendar on Saturday, July 26. 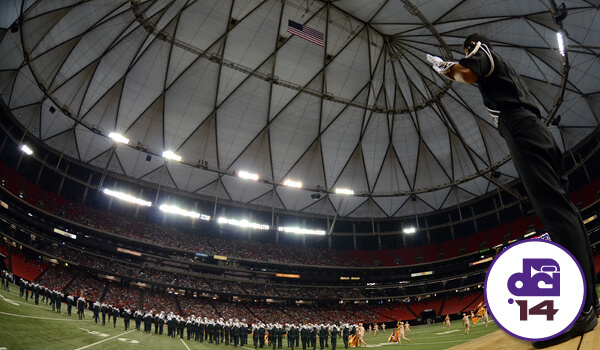 "Scheduling the Southeastern Championship can sometimes be a challenge because of the popularity of the Georgia Dome as an in-demand destination for conventions and other events," DCI Director of Events Susan Kuehnhold said. "We were definitely pleased to see how many fans were able to rearrange schedules to join us for a Sunday event last year, but we're very happy to be back at the Georgia Dome on our traditional Saturday date in 2014." The final weekend of the regular season will include events at J. Birney Crum Stadium in Allentown, Pa. on Friday, Aug. 1 and Saturday, Aug. 2, featuring all 22 World Class corps over two days of competition. "Connecting the dots" between the Premier Events will be the bulk of the 2014 DCI Tour schedule. Sanctioned events in cities like Fairfield, Ohio and Rome, N.Y. help create the waypoints and performance opportunities necessary for DCI's corps to travel safely and efficiently from one competition to the next. "Many thanks go out to our dedicated national network of Tour Event Partners who help produce, promote and manage all of those 'dot-connecting' events that are an integral part of the tour," Kuehnhold said. 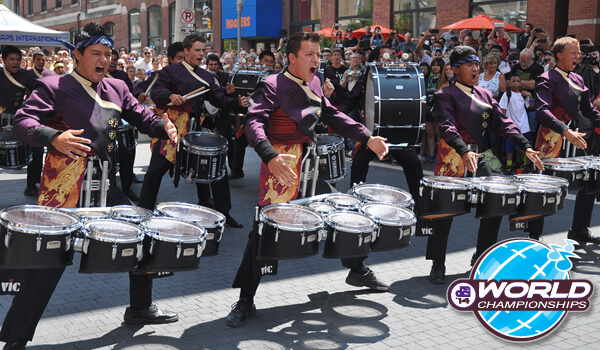 DrumLine Battle teams will take to the streets of Downtown Indy as part of the festivities at the DCI World Championships. As they've done since 2008, Open Class corps will once again kick off the week of Drum Corps International's World Championships with a Prelims and Finals competition at Ames Field in Michigan City, Ind. on Aug. 4 and 5. After the Open Class World Champion is named on Tuesday in Michigan City, corps will start arriving in Indianapolis to participate in the Individual & Ensemble Championship presented by System Blue (I&E) on Wednesday, Aug. 6. Reorganized in 2013 to feature both World and Open Class corps in a single event, I&E gives corps members the opportunity to showcase their individual and group talents in a number of solo and ensemble categories. World and Open Class corps will compete head-to-head beginning Thursday, Aug. 7 at Lucas Oil Stadium marking the sixth straight year that the Championships have been held at the state-of-the art indoor venue. The top 25 corps will advance to the Semifinals on Friday, Aug. 8 with the top 12 advancing to the Finals competition on Saturday, Aug. 9. "With more than 20,000 people at Lucas Oil Stadium last August, we marked our highest Finals-night attendance since coming to Indianapolis in 2009," Acheson said. "We're excited to continue our partnership with the City of Indianapolis to create an exceptional stage for our performers and destination for their families, supporters and fans from around the world." Preceding the Finals competition on Saturday morning and afternoon will be the second-annual Championships for DrumLine Battle?„? and SoundSport® teams. Two of DCI's exciting new ventures, DrumLine Battle allows drum lines of any age, size and makeup to face off in a confined "battleground" environment, while SoundSport features groups of 50 members or less of any age and instrumentation performing in an intense, up-close competitive setting. This special event on Finals Day will feature a variety DCI drum corps and independent teams. "With hundreds of DrumLine Battle and SoundSport teams forming across the country and around the world, the enthusiasm for these two new program offerings continues to grow," DCI Director of Business Development John DeNovi said. "For the Championships, we've already started looking ahead to an expansion of the DrumLine Battle stage to Downtown Indy's Pan Am Plaza which is an open area right off of Georgia Street and just a couple of blocks from Lucas Oil Stadium." Starting Monday, Dec. 9, tickets to nearly 20 of the most popular events of the 2014 DCI Tour will go on sale through the DCI Box Office and Ticketmaster. 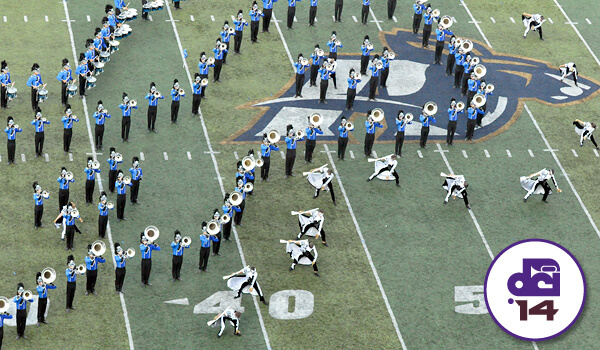 Events will include the DCI Southeastern Championship at the Georgia Dome in Atlanta and the DCI Southwestern Championship at the Alamodome in San Antonio, along with single-night tickets to the 2014 DCI World Championships. Sign up for Drum Corps International's "Box Office Alerts" to receive e-mail notification when tickets to 2014 DCI Tour events near you will be going on sale. 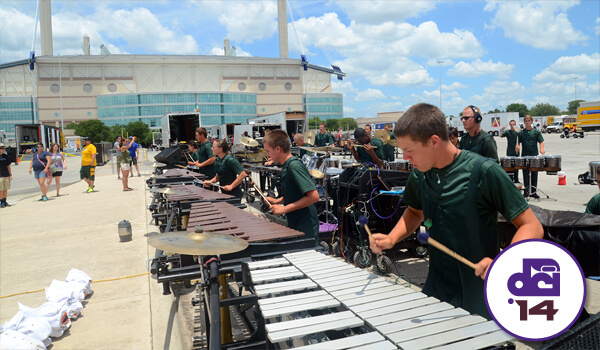 The DCI Southwestern Championship at the Alamodome will bring drum corps deep into the heart of San Antonio, Texas. 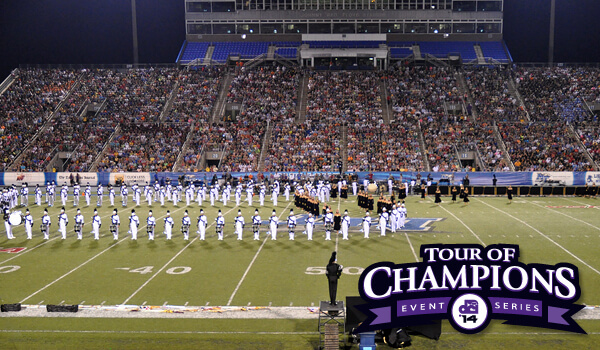 Middle Tennessee State Unviersity will host a 2014 Tour of Champions series event on July 25. The DCI World Championships will return to Lucas Oil Stadium for the sixth straight year in August. Open Class Prelims Ames Field, Michigan City, IN Monday, August 4 Open Class Finals Ames Field, Michigan City, IN Tuesday, August 5 Individual & Ensemble Championship presented by System Blue Georgia Street, Downtown Indianapolis Wednesday, August 6 Hall of Fame Kickoff Party Historic Union Station, Downtown Indianapolis Wednesday, August 6 World Championship Prelims Lucas Oil Stadium, Indianapolis, IN Thursday, August 7 World Championship Semifinals Lucas Oil Stadium, Indianapolis, IN Friday, August 8 DrumLine Battle & SoundSport Championships Georgia Street, Downtown Indianapolis Saturday, August 9 World Championship Finals Lucas Oil Stadium, Indianapolis, IN Saturday, August 9. Events, dates and locations subject to change.